Since 1944, the Cardinals are the only National League franchise to win three consecutive pennants. Before the Cardinals’ stretch of pennants from 1942-44, the last National League franchise to win three consecutive pennants was the Giants. They won four in a row from 1921-24. Since 1900, the only other franchises that have won three National League pennants in a row are: Pirates (1901-03), Cubs (1906-08) and Giants (1911-13). Managed by Billy Southworth, the 1942-44 Cardinals also were the first National League teams with 100 or more wins in each of three consecutive seasons. In 1944, the Cardinals took the National League lead on April 29 and never relinquished it. A September slump kept them from clinching early in the month. They’d lost eight of nine entering a Sept. 21 doubleheader against the Braves at Boston. In the first game of the doubleheader, the Cardinals broke a 4-4 tie in the eighth when George Fallon singled to right with two outs, scoring Whitey Kurowski from second. 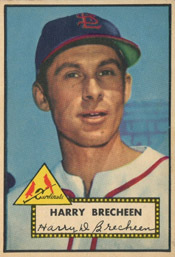 Harry Brecheen pitched five innings in relief of starter Mort Cooper and got the win. In the second game, Cardinals pinch-hitter Walker Cooper slugged a two-run home run off starter Jim Tobin in the ninth, tying the score at 5-5, and Marty Marion drove in Ken O’Dea from second with a single in the 10th, lifting St. Louis to a 6-5 victory. The Cardinals finished the 1944 season at 105-49, 14.5 games ahead of the runner-up Pirates, and clinched the World Series championship with four wins in six games against the crosstown Browns.